(Public) Certificate File: This file contains the certificate public key part. (Private) Key File: This file contains the private key part. (Public) Root Certificate File: The final file that SSL requires is the Certificate Authority certificate file. You can obtain this from the Internet Explorer in Trusted Root Certificate Authority dialog. Select the Authority that issued your certificate and export it in Base64 (cer) format. The type of certificates we need are .pem files. The PEM extension is used for Base-64 encoded X.509 certificates. They contain ASCII armored data between “—– BEGIN …” and “—–END …” lines. Sometimes the certificates come in a single pem file. In this case, you need to open it with a text editor and save the individual certificates in separate pem files. Certificates can be obtained from a trusted certificate authority. You can also generate your own but the browser will not trust this and will display a warning. If you have a certificate in .pfx format, you’ll have to convert it first. In this case we need a utility called openssl.exe. First, download and install the OpenSSL Windows binaries from here (at you own risk). The lite version of the binaries is sufficient. Openssl.exe will ask you for the password of the pfx file. Leave it blank if you did not specify one. It will also ask you for a new password for the .pem file (= optional). The certificates are converted to single pem file. You need to open the converted pem file with a text editor and save the individual certificates in separate pem files. 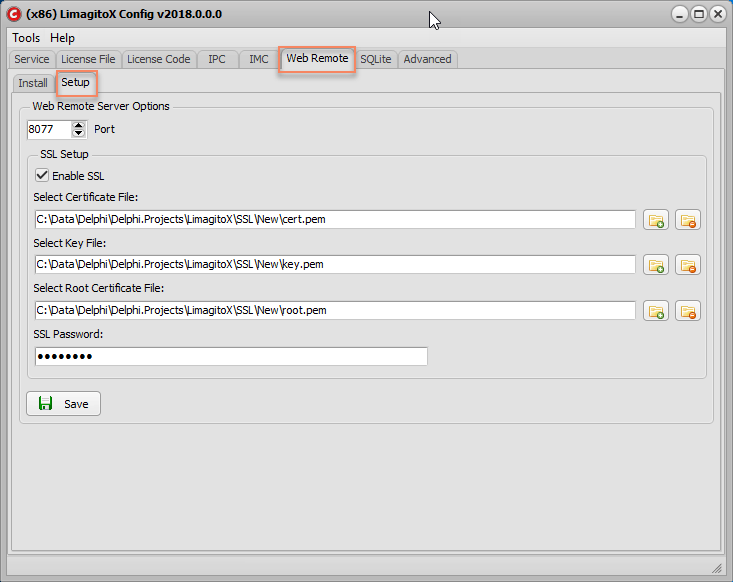 Web Remote Setup is available in our LimagitoX Config Tool.